A Single Shard is a book I've been avoiding for years. 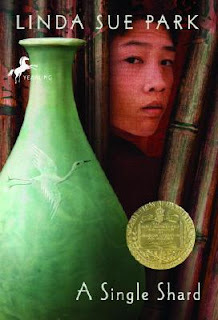 Every classroom library I've been in has had it, but there was nothing appealing to me about the cover nor the idea of a novel about 12th century Korean potters. I now have more access to audiobooks thanks to my US library's Overdrive accounts. Their selection is still growing and all the audiobooks that appeal to me are frequently checked out, so I thought I would give Linda Sue Park's novel a try. It couldn't hurt to listen to it as I folded clothes or cooked, I thought. I'm torn by A Single Shard. I enjoyed it and thought it was a sweet story. It somehow won a Newbery medal. I also don't know any young readers who would make it all the way to the end, since it is so simple and spare. Yet, I wouldn't want to read it aloud to a class because I think they would find it boring. So who should read it? I'm not sure. I think it is worth reading but I won't be recommending it. This wishy washy review isn't very helpful, but is the only way to sum up my feelings about A Single Shard. I guess this is the true definition of a 3 star review. If you're going to read it, the audiobook is the way to go. I love a British accent and it's always nice to get your laundry folded!